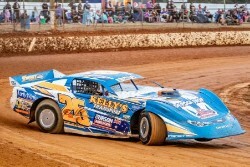 The Brims Concrete Super Sedan Series, supported by McCosker Contracting heads to the Ian Boettcher Race Parts Kingaroy Speedway on Saturday night. The series has had many different winners in recent weeks, with Ian Brims winning last Saturday night in another thrilling finish. Sixteen drivers have entered for Saturday night, including Tania Smith who has finished on the podium twice in the last few weeks, Matt Pascoe and Darren Kane, while Sean Black who has been highly prominent this season is also entered. Add to this, Leigh Williams, Wayne Randall and Gavin Northfield, a highly entertaining night at the Showgrounds venue is assured. Super Sedans return the Corbets Group Mothar Mountain Speedway, Gympie for the next round of the Brims Concrete Super Sedan Series, supported by Think Money. The last time the Super Sedans were on the Mountain, Ian Brims and Sean Black fought out the concluding stages with Black victorious. Since then the tables have been turned with Justin Randall winning an exciting Feature event at Archerfield. Randall is not entered for this round, however a strong field of seventeen drivers will compete on Saturday night. Apart from Black and Brims, the field also includes Tania Smith who finished third in the Archerfield A Main and will be looking to keep her strong recent form going. Matty Pascoe returns, and will be hoping for a strong result also on Saturday night. Local hero Mark Pagel is also amongst the entries, while Leigh Williams should also be prominent across the nights action. Three drivers have elected to play their joker for this round, with Nicholas Okeefe, Sam Roza and Matt Pascoe all looking for the additional points in the series. Racing will commence at 5pm EST, with events for Junior Sedans, National 4s, Street Stock, Production Sedans and Modified Sedans also scheduled. In what was an extremely entertaining exhibition of speedway sedan racing, Justin Randall secured his second Super Sedan feature race win for the season with a terrific drive to take out round 11 of the Brims Concrete Championship Series at Ausdeck Patios Archerfield Speedway on Saturday night (February 16). In the absence of series leader Matt Pascoe, it was Sean Black who carried the burden of favouritism into the event and he certainly looked the goods for much of the race but was unable to keep Randall at bay in the closing stages and had to settle for second. A great three-way scrap for the final spot on the podium eventually fell in favour of Tania Smith, leaving Wayne Randall and Ian Brims to fill fourth and fifth respectively. Presented with an excellent track, the opening heat saw David Musch charge around the outside of Nicholas O’Keefe on lap three to take over lead before clearing away to finish more than three seconds clear of the field. Tony Brinkman advanced from fourth to finish second, with O’Keefe third home. With a pole position start in heat two, Black was never seriously tested and romped home by more than seven seconds. It was much closer though for the minor placings with Bob McCosker clinching second spot by the merest of margins over Brims. Wayne Randall also won from pole position in heat three, however he was hounded throughout by Brims, who started on the outside front row. In another strong run from Brinkman, he secured third on this occasion ahead of both Musch and Black. The final heat produced the closest result with Justin Randall edging out Smith for the win, while David O’Keefe was third on this occasion. The Pole Shootout commenced with both Justin and Wayne Randall advancing from the Bronze round to take on Black and Brinkman, whose night unfortunately ended at this point when he whacked the wall in turn one as Black and Wayne Randall moved forward to take on Brims and Musch. The final showdown saw Black emerge with the best time to secure pole position for the 30-lap feature race, although he would ultimately choose to start from the outside front row. Brims finished second quickest ahead of Randall and Musch, who started the feature race with a flurry before eventually falling out of the top five. Black shot straight to the front at the start of the feature, only for David O’Keefe to wipe out in the main straight and halt proceedings before a lap could be completed. Black again got the jump and immediately settled mid-track as Musch also found a higher line to his liking, only for the race to be halted when David Mortimer spun in turn two. Upon resumption, Musch charged around the outside of Brims to take second spot and looked as though he would reel in Black in rapid time, only for Mortimer to spin again and trigger another restart, for which he was ordered to the infield. When racing resumed, Brims wasted no time in reclaiming second from Musch, who quickly found himself shuffled back several spots as Wayne Randall, Smith and Justin Randall moved ahead. With 10 laps down, Justin Randall had charged into second spot ahead of Brims, leaving his father to fight Smith for fourth. Out front, Black still looked comfortable at the halfway mark even though Randall Jnr was closing in. However, as lapped traffic became a factor, Randall zoomed into contention and the two leaders ran two-wide for several laps, with Black valiantly fighting back every time Randall edged ahead. However, Randall was able to secure the lead on lap 27, leaving Black to fend off a late surge from Smith, who had disposed of both Brims and Wayne Randall in a frantic finish. Brims would ultimately fall to fifth behind Randall Snr, with Musch sixth ahead of McCosker, who was the last car to finish on the lead lap. Dale Christensen, Dion Bennett and Ed Doherty rounded out the top ten, with Rodney Craft and Nicholas O’Keefe completing the finishers. After what has been a busy few weeks of Sprintcar competition, it is time for sedan fans to get their fix of dirt track tin top action at Ausdeck Patios Archerfield Speedway, with round 11 of the Brims Concrete Super Sedan Series to be contested this Saturday night (February 16). In addition to the Super Sedan action, AMCA Nationals, Wingless Sprints, Modlites, Open Sedans, RSA Sedans and Ford vs Holden vs Sigma Sedans will also be the program, with nearly 100 competitors ready to hit the track for another huge night of action. One of Australia’s most accomplished drivers in Matt Pascoe heads the Super Sedan field and, such has been his dominance so far this season, the two-time national champion currently leads the series despite missing the previous round. Fresh back from his annual pilgrimage to Tasmania where he again represented Queensland with distinction to finish third in the rich Apple Isle Grand Prix, which was followed by a runner-up result at Carrick Speedway, Pascoe will relish a return to his home track this weekend and the opportunity to expand his points advantage. When trying to determine who will most likely emerge as Pascoe’s biggest threat on Saturday night, the answer seems pretty clear. Toowoomba’s Sean Black is enjoying a stellar season that has included some exceptional results in Queensland and interstate. In fact, Black finished ahead of Pascoe in the Apple Isle Grand Prix, leading the event for more than 35 laps before finishing second, beaten only by current national champ Callum Harper. An identical result in the Super Sedan Grand National the following weekend and a subsequent win in round 10 of the Brims Concrete Series in Gympie earlier this month has Black in peak form for Saturday’s showdown. Of course, having completed more laps of Archerfield and won more feature races than the rest of 90+ nominated competitors combined, Wayne Randall is always a serious threat when the Super Sedans hit the track and he will be joined in battle by his son Justin, who scored a breakthrough feature race win in Toowoomba earlier this season. Another veteran in Ian Brims will be also be amongst the front runners in the 16-car field and joining him in representing New South Wales will be Tania Smith, Dion Bennett and David Mortimer. Others who have emerged as potential podium challengers include Bob McCosker and Tony Brinkmann, but the key to success will almost certainly be a willingness to run the highline. As Black proved at their last Archerfield outing, running the outside is hard work that requires patience and persistence, but it almost always brings rewards. If there is any race category that has demonstrated just how exciting and rewarding it can be when you are prepared to use the whole track in pursuit of victory, it has been the AMCA Nationals. 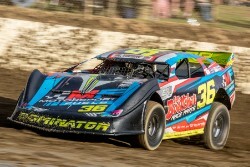 With consistently big fields this season, the racing has developed to a new a level of intensity in which three-wide racing is a common feature whenever they hit the track. Newly crowned Queensland champion Tony Blanch returns to the scene of his title triumph to take on the likes of Steve Potts, Steve Price, Nathan Durston, Michael Mason, Tim Gamble and Thomas Vickery in what seems certain to be another night of intense Shock Absorber Therapy Track Championship action. Wingless Sprints have also impressed so far this season and, whilst their numbers are down a little this week, there is still a posse of potential feature race winners in the field. The likes of Dan Moes, Brad Keiler, Andrew Robinson and Paul Robinson will be in the mix, with Brant Chandler also hoping to be amongst the front runners. Having been one of the best performers in the category for several seasons, Chandler has struggled for results this season and will be desperate to rediscover his best form and reacquaint himself with victory lane. From a small field of Modlites, Terry Leerentveld seems almost unbeatable, with Nathan Politch and Steve Collins perhaps the most likely to offer some resistance. Gates open at 4.00pm and early racing gets underway from 5.00pm, with the main program kicking off at 6.00pm. For more information and event updates, follow Archerfield Speedway on Facebook, Instagram and Twitter. The Brims Concrete Super Sedan Series supported by Think Money was held at the Corbets Group, Mothar Mountain Speedway in Gympie, on Saturday night, resulting in a dramatic finish after 30 laps. In fact the race went thirty one laps due to a green, white, chequered flag finish in what was a great race, between eventual winner, Sean Black and Ian Brims who led all but the last two laps. Six qualifying heats were held and were evenly shared, as has been custom with the series. With Mark Pagel narrowly winning the opening head, before Darren Kane comfortably won heat two. Kane backed up his earlier win by narrowly defeating Dale Christensen in heat three, with Tania Smith downing Mark Pagel by a mere 0.162 in heat four. The final round of heats saw race wins to Wayne Randall and Ian Brims, both recording comfortable wins. Darren Kane, Tania Smith, Ian Brims, Mark Pagel, Sean Black and Dale Christensen were the top six, and would face the marble draw for positions in the A Main. Ian Brims was successful drawing the number one marble with Sean Black starting on his outside. Dale Christensen would make up row two with Darren Kane, while Tania Smith and Mark Pagel were draw the third row. Brims would lead from the outset from Sean Black, with the racing close and tight throughout. Christensen would drop right back through the field in the early stages, with Mark Pagel dropping to seventh in the early stages before moving to fourth on lap five. Likewise, Wayne Randall went backwards at the start, dropping to tenth, but by lap seven, he was in fifth place as positions behind the leaders changed continually. Black hounded Brims lap after lap, as Randall and Pagel both passed Darren Kane in one lap at the mid-way point of the race. 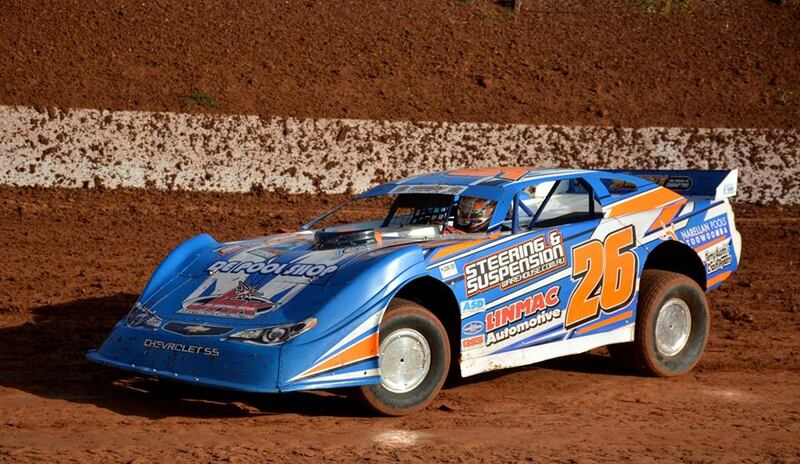 Pagel then would get the better of Randall with ten laps remaining. The duel for the lead came to a crescendo with contact between Black and Brims, with Brims being deemed the cause and sent to the rear of the field. Black would survive the two lap restart to defeat Mark Pagel, Wayne Randall, Darren Kane, David Musch and Joshua McLaren. 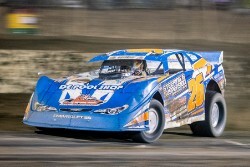 The Brims Concrete Super Sedan Series supported by Think Money heads to the Corbets Group, Mothar Mountain Speedway in Gympie, with a quality field entered for Saturday nights round. 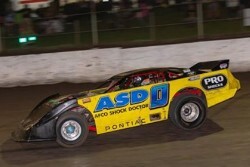 Sean Black and Darren Kane return to the series after a fortnight in Tasmania which saw both drivers have success. Black finished second to National Champion, Callum Harper, at both the Super Sedan Grand Prix and Grand National, putting in two stellar drives while Darren Kane won a time shortened event at Carrick in between. Black has been super consistent this season and will be extremely hard to beat at the unique layout, where Kane has also had success. The field will also include home town hero Mark Pagel, along with Wayne Randall. Unbelievably, Tania Smith will have here first ever race at Gympie in a Super Sedan on Saturday night, after having raced a Modified Sedan once at the venue 20 years ago. A full support program of Junior Sedans, National 4s, Street Stock, Production Sedans and Modified Sedans will ensure a great night of sedan racing across the board.